This beautifully illustrated Bible is perfect for anyone interested in reading the Word of God! 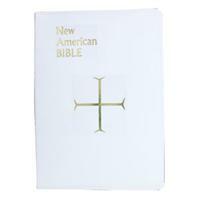 The imitation leather cover featuring a family record section, this Bible becomes a great gift for a wedding. Also contains large easy-to-read typeface with all footnotes and cross-references keyed in the text. With the addition of over 30 self-explaining maps in context, 70 living photographs, and a historical survey of the lands of the Bible, this edition is quite beautiful and has full color illustrations. 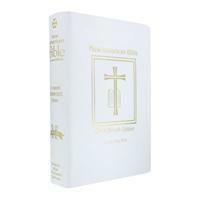 This Bible is a great gift idea for any Catholic whether for a wedding, Confirmation, First Communion or RCIA this Bible will become an heirloom. 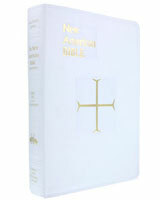 Use the Add To Cart Button to add your personalized Bible to the shopping cart. 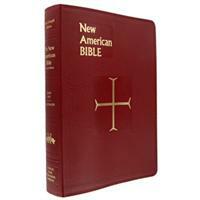 Bibles without the Number of Lines and Font Style fields selected will not be imprinted. 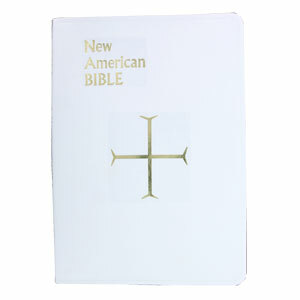 A full sized Bible with a slightly nubby imitation leather cover and central gold embossed cross. Full text with study features, color illustrations, family record and presentation pages. A Bible meant to be used and treasured. Giftboxed. 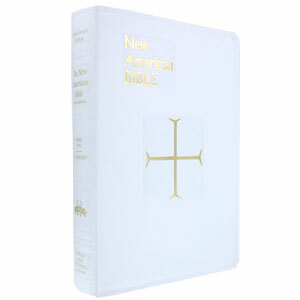 A full sized imprintable white leather Catholic Bible with gilded edges. 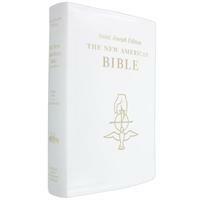 Features like a presentation page, full color illustrations, and study features, along with a leather cover and durable binding make this Bible ready for a lifetime of reading. 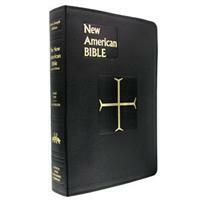 A full sized, red imitation leather Bible with black & white illustrations. Full color family record pages inserted into the center of the Bible. Wonderful for personal or group study.